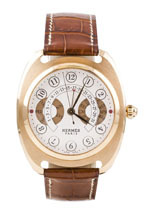 You might not be familiar with Hermes watches, even if you are familiar with the brand. They’re not known for their timepieces; they’re best known for their leather products, and their handbags in particular. Founded in France in 1837, the company concentrated primarily on leather goods for more than a century and didn’t really expand their product line into other offerings until the 1970s. Don’t let that fool you, though – Hermes watches, while fairly new to the marketplace, are well made and offer some surprising design elements. If you want something that will definitely attract attention for more than just the name, you definitely want to take a closer look at these beautiful watches. Read on for the full Hermes watches review. Many fashion companies don’t give much thought to their timepieces; they’re usually an afterthought and in a lot of cases, they’re not particularly interesting. That’s not the case here, as these are well crafted timepieces using quality materials. They use sapphire crystal on all of their models and their cases are stainless steel, gold, or a combination of the two. Water resistance is modest; most models are rated at either 50 meters or 100 meters. This isn’t a flaw; it’s just that these are fashion watches and not diving or sports models. 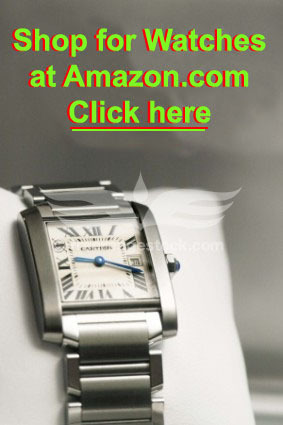 These watches are Swiss-made, using automatic mechanical and quartz electronic movements. These aren’t just “me, too!” products, some of their limited edition mechanical models are quite elaborate and offer multiple complications such as the date or the phases of the moon. While you won’t generally expect innovation from a fashion company, you might be surprised. Their design elements are quite interesting and they manage to take features that many take for granted and turn them into something interesting. The display of the date is clever; some of their models use a pointer and a dial to indicate the date, rather than the more common number-in-a-window. They make some skeleton models, too, so that you can see the works moving. Some of their styles are unlike anything we’ve seen anywhere else, too. 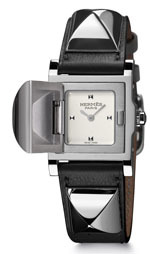 Hermes watches offer some surprisingly creative styling, with unusual shapes, colors, and face designs. This is quite a surprise, as many fashion companies simply go through the motions when they make a decision to add timepieces to their product line. That’s not the case here, and while you will find some traditional styling, you’ll also find some modern and unusual styles, as well as the usual gold and diamonds that one might expect from a high end producer of luxury watches. Displays are all analog, of course, and the company does produce a number of limited edition models from time to time. Their Dressage watch from 2007 was limited to 170 pieces, for instance, and now sells for quite a premium. You won’t find much in the way of sports watches here, but they do make a chronograph or two. Many of their models are more scaled towards business wear and evening wear, and that’s not surprising, given their market. Maintenance and care will vary depending on the model. Those with quartz movements require little in the way of care, and will only need to have the battery replaced every two years or so. Those with automatic movements will require some additional care. Most companies that manufacture models with automatic movements recommend that they be serviced every five years to ensure that they are working properly. We haven’t seen any indication that these require such care, but you should contact the company and inquire. Aside from this, you should store your watch in a cool, dry place and keep them away from extremes of temperature or strong magnetic fields. Automatic models should be stored in a watch winder if you’re not wearing it regularly to keep it working properly and maintaining accurate time. With proper care, you’ll find that these watches will last for many years. The warranty is the industry standard – the company warrants the timepiece to be free of defects in materials and craftsmanship for two years from the date of purchase. These are high quality products that are rigorously tested at the factory prior to shipping, so defects are unlikely. Those that do pop up should become apparent well within the warranty period. As with the rest of the company’s products, prices tend to the high side. On the low end, prices start at a recommended list price of about $2850. On the high end, we’ve seen some limited edition models priced at about $35,000. Most of the company’s watches fall in the $4000-$10,000 range, which makes them fairly expensive, but not exceptionally so, at least when compared with other luxury brands. We’re not yet seeing a lot of collector interest in the brand, but they haven’t been making them for all that long and collectors may not yet have realized how well made and fascinating they are. We think that in time, this brand may become far more collectible than it is right now. We’re not suggesting that you should run out and buy as an investment, but if you buy one just because you like it, you may find that it eventually appreciates in value. Just consider that a bonus. You can find the brand for sale at a number of the company’s own boutiques, which are located in major cities around the world. There are about 20 of them in the United States, but they’re all located in big cities. 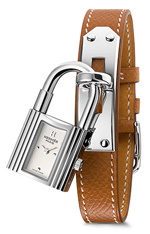 You cannot buy Hermes watches at the official Website. Officially, that seems to be the only way to buy them, as the company aggressively tries to restrict both distribution and pricing of their products. Many high end brands do this in order to avoid giving the impression that their products are either common or ordinary. Keeping them relatively scarce keeps demand ahead of supply and that, in turn, keeps the prices both high and stable. If you aren’t interested in traveling to New York or Los Angeles to buy your timepieces, then there’s the “unofficial” way – there are a number of retailers on the Internet who carry the brand, and that makes it possible to buy at a discount. You’ll save money that way and you’ll likely save yourself a trip, too. We were pleasantly surprised by Hermes watches, and we think you will be, too. No, they’re not cheap by any means, but they are well made and they’re attractive and suitable for both business and formal occasions. They offer lots of innovation, interesting features and some designs that are genuinely unique. 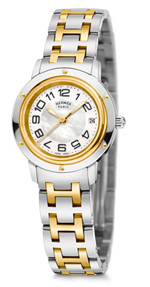 If you want something that’s unusual but not avant garde, then you should definitely give Hermes watches a good look. Rolex Submariner Date - Best Watch for Investment? Swiss Made Watches - What Does It Mean?